Maryland waters reel in millions of tourists annually, and with good reason. The come to swim, fish, sail, kayak - or to hunker down at crab festivals and clam bakes that Maryland is rightly famous for. With more than 30 miles of Atlantic Ocean coastline, Maryland's most popular beaches include those that appeal to the young, the young-at-heart, and families with kids -- like those at Ocean City, and Breezy Point Beach. With even wider appeal for hikers and naturists, there are state park beaches like Point Lookout and Sandy Point State Park and, for nature truly in the wild -- Assateague Island National Seashore. Heading to the shore just for the Maryland crab cakes? You can't beat Crisfield, the self-proclaimed "Crab Capital of the World." • The 3-mile promenade in Ocean City often makes the Top Ten list of America's great boardwalks. • In 1989, the Maryland Blue Crab was designated as the official State Crustacean. • Although Assateague island provides plenty of opportunities for swimming, crabbing and clamming, it's most famous for the group of wild ponies that live in the area roaming the beaches and marshes. 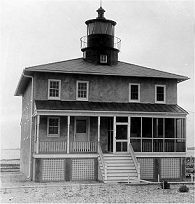 • Built in 1830, The Point Lookout Lighthouse has gained a reputation as the most haunted lighthouse in America. A number of its spiritual inhabitants include several shipwreck victims, a former lighthouse keeper, and one very forlorn Confederate solider. Bay & Beach Guide - Courtesy of the Baltimore Sun, featuring guides & information on eastern shore beaches including Ocean City, Assateague Island, Chesapeake Bay and more with pictures and area attractions. Beaches in Baltimore, Maryland - USA Today guide to the top spots for hitting the beach throughout Baltimore county with information on admission, amenities, and related resources. Find Your Chesapeake - Here's the digital doorway to regional attractions, with travel photos & video clips, info on weekend getaways, crabbing, swimming, historic sites, and related maps. Places to Swim in Maryland- Check out the complete guide from the Maryland Department of Resources with a directory of state parks offering everything from sandy beaches to river swimming holes.